The English Show Tippler was developed in the 1870's and 1880's from the Macclesfield Flying Tippler and perfected over the following century; by the 1900's there was fierce competition in the breed and it became a 'specialist's' variety of great beauty. The English Show Tippler is a challenging breed for the serious breeder, and as such has never been, and probably never will be, a 'common' breed, though it is always much admired by all who see it at shows. 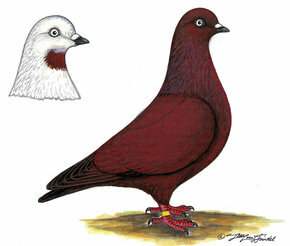 The English Show Tippler is now extremely rare worldwide is limited to just a handful of breeders largely in the UK; almost all of the existing stock descend from the birds of the late Ken Shaw who for more than 50 years bred the Show Tippler to the highest standard and was recognised as a 'Master Breeder' by the National Pigeon Association. My birds are based on the very successful stud of Mrs Pat Blewett, which I was extremely fortunate to be able to purchase when they were destined for export. They have an impeccable pedigree being descended directly from birds bred by the late Ken Shaw and have had no outcrosses to any other breed. I am proud to be able to state that my stud of English Show Tipplers is pure and authentic, they are tough, hardy, fit and healthy with good fertility and parental skills and show no indication of any undesirable characteristics. I have obtained individual birds from two other breeders whose birds originated from Ken Shaw, and though not unrelated have helped to expand the gene-pool in my stud albeit only marginally! I make absolutely no apology for stating that I am indeed very proud of my English Show Tipplers! The intrinsic beauty of the English Show Tippler is the colour, a colour which is universally known as ‘Brander Bronze’ – in other parts of the World, the colour is colloquially known as ‘Copper’, ‘Chimney Sweeper’, and ‘Coffee brown’. Whilst Brander Bronze is seen in numerous other breeds in the English Show Tippler the colour has been perfected to the highest degree being a rich chocolate/chestnut brown with a metallic mauve lustrous sheen ; the tail has a distinct black bar and the primary and secondary flight feathers have contrasting black tips. Difficult to believe that essentially colour is a modified blue! Because of its complex genetic make-up the English Show Tippler has always been regarded as a 'difficult' breed. There seems to be a mystique about the breed and sadly far too often the genetics of the breed has been misunderstood. There are four varieties, recognised in the English Show Tippler, these being the 'Self', the 'Dark Mottle', the 'Light Mottle', and the 'Chuck' All four varieties have the richly coloured tails and wing feathers with the distinctive black markings. The varieties are clearly shown in the Feathered World illustration dating from 1909. Today the only variety seen at shows is the 'Self', though I have always hoped and believed that by selection and careful breeding there was the possibility of breeding the others varieties from the existing gene-pool. I firmly believed that the gene-pool of my stud did not contain the necessary factors to produce anything other than 'Self' ..... but I was wrong! By sheer good fortune I now have several related birds showing the 'Mottle' colouring, and have one very presentable 'Dark Mottle' hen. I am very hopeful that within a couple of years I will be able to put one or two in the show pen, and hopefully release them to other breeders. I must stress that these birds are the result of a pairing of 2 birds of my breeding which by good fortune both carried the required genetic factors; they are not the result of the introduction of any other breed or indeed bloodlines ... just sheer good fortune! Once I have established a line of 'Dark Mottle' it will be a relatively simple step to move on to the 'Light Mottle', though these have little interest for me. It would also be possible from these birds to develop the 'Chuck' but I most certainly have no intention, or desire, to 'make' a 'Chuck' because I believe that the method of 'making' a Chuck is unethical, cruel and contrary to their welfare. The genetics of the colour in the English Show Tippler is extremely complex and has been perfected over more than 130 year. At the most basic level the colour is produced by the mixture of T-Pattern (CT), Recessive Red (e), and Brander Bronze (KB), however it is far more complex than this. The colour existed in the Show Tippler before 'Brander Bronze' was introduced in the early 1900's and so there clearly is another form of bronze involved as well! Many other genes including ‘Dirty’ which causes a darkening of the colour of the feathers, beak, feet, and skin of the birds; ‘Sooty’ which causes darker areas in the centre of feathers most noticeable in the wing shield; ‘Undergrizzle’ which causes a noticeable lightening of the flight and tail feathers except for the tips of the flights and the tail bar; ‘Grizzle’ which has a lightening effect on the feather colour; ‘moult-to white’ which is only seen in recessive red and causes red feathers to become white after the moult; and ‘Pearl eye’ which cause the white iris colour. In addition to these genes there may well be others contributing to the English Show Tippler genotype, and there are also many polygenes which enhance the various characteristics. The Self English Show Tippler is homozygous for all these genes with the exception of recessive red [e]; the heterozygote [e//+] being the desired show colour, the homozygote [e//e] being the red mottle, and the bird with no recessive red [+//+] being the dark phase bronze, also called kite or ‘black’. Only the heterozygote can be shown, and in less enlightened times breeders rigorously culled the other two forms. Today it is accepted that a pairing of the Recessive Red mottle (e//e) and the dark phase bronze (+//+) is possibly the ideal mating as it results in 100% heterozygotes (e//+) which are all potentially of the desired show colour. The English Show Tippler is highly inbred with a very small gene pool, however it is still a very strong, healthy, vigorous and viable breed with no problems. Because of its very complex genotype outcrosses to other breeds must only be considered as a last resort : the genotype of the English Show Tippler took many years to perfect, and one ‘wrong’ mating could undo all that good work. 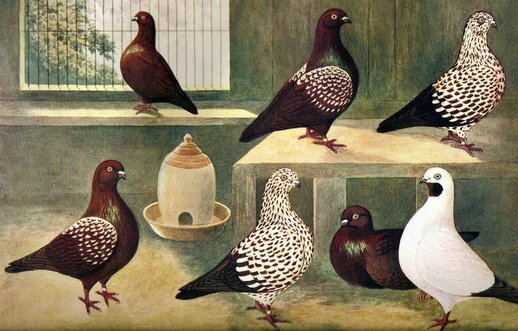 The United Show Tippler Club which was founded in 1891 is affiliated to the National Pigeon Association and is recognised as being the specialist club for the breed. and has responsibility for maintaining the Breed Standard. The USTC has a website and further information on the English Show Tippler can be found there, John S Harrison is the Secretary of the Club. Origin: The breed was developed in Great Britain at the end of the 19th century from the Flying Tippler; the Brander bronze colouring was introduced from crosses to the Danish Tumbler. The breed was developed purely as an exhibition bird and must not be confused with flying varieties. 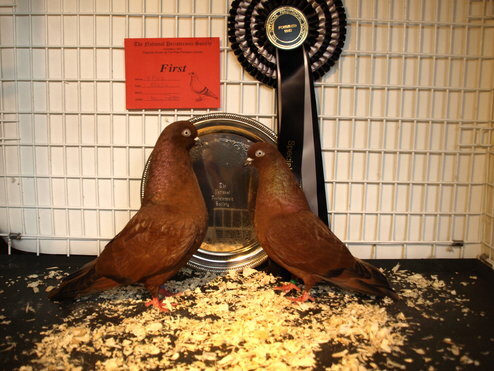 The English Show Tippler is a small to medium sized pigeon (average weight 350g); the most important element is richness of colour showing a metallic mauve sheen.The black tail bar and flight tips are an essential feature of the breed. Type: Broad chest and shoulders with strong wing butts. The body tapers from the shoulders to tail to form a wedge shape. Head: Small to medium in size showing no exaggeration. The skull is round and not too full in front. Eye Ceres: Ceres to be finely textured and dark in colour. Beak: Medium in length. Carried horizontally. Colour dark horn to black. Wattles: Finely developed, lacking any sign of coarseness. Neck: Short, stout at the shoulders, tapering well up to the head. Breast: Broad and, well rounded. Back: Broad at the shoulders tapering to tail. Wings: Medium length wings carried onthe tail.Flights short and broad, overlapping each other when expanded. Tail: Tail feathers, 12 in number, to be broad and overlapping. Tail carried in line with the back sloping with the tip held clear of the ground. Plumage: Short and close feathered, soft and silky in texture. The English Show Tippler is only recognised in one colour, this being a rich chocolate brown that must have a metallic mauve sheen, showing no signs of green. The primary and secondary flights have a clearly defined dense black tip to each feather and the tailfeathers have a strong black bar approximately 13mm from the end of the tail, the tail bar must cover all 12 tail feathers. Other than the black tail bar there must be no inclination to black colouration in the rump or tail. The recognised show colour is a heterozygote, therefore 25% of the offspring will be Red Mottles and 25% Kite or Dark Phase, though these are ideal for breeding purposes they are not eligible for show. Self-Coloured – Rich chocolate brown throughout, especially the under-part of the body through to the tail. White feathers should be penalised. Dark Mottle – Rich chocolate brown with white feathers evenly distributed on back and wings, but not including the bars. All flight and tail feathers must be rich and sound in colour. White feathers on any other part of the body other than as described are considered foul. Light Mottle – White or light ground colour with rich chocolate brown feathers evenly mottled throughout. All flight and tail feathers must be rich and sound in colour. Chuck – A rich chocolate brown chuck on throat below the lower mandible is to be distinct and even. Primary flight feathers and tail feathers to be rich and sound in colour, the remainder of bird viz. head, neck, body and wings, including secondary flights, back and rump to be white or as clear as possible. The secondary flight feathers must be either all white when it is known as a “10 x 10 Chuck”, or must be rich and sound in colour when it is known as a “Full-Flighted Chuck”. In all four colour varieties there must be a well-defined Black tail bar; and all primary and secondary flight feathers must be clearly tipped Black with the exception of the white secondary feathers in the “10 x 10 Chuck”. Colour is the main consideration; after colour priority is given to Type followed by Markings. Colour and Type are the two essentials for without them even perfect markings will not make a good show specimen. Only after these three main ingredients have been achieved do factors such as eye, beak, and cere come into the equation. The English Show Tippler must never at any time be judged primarily on condition.